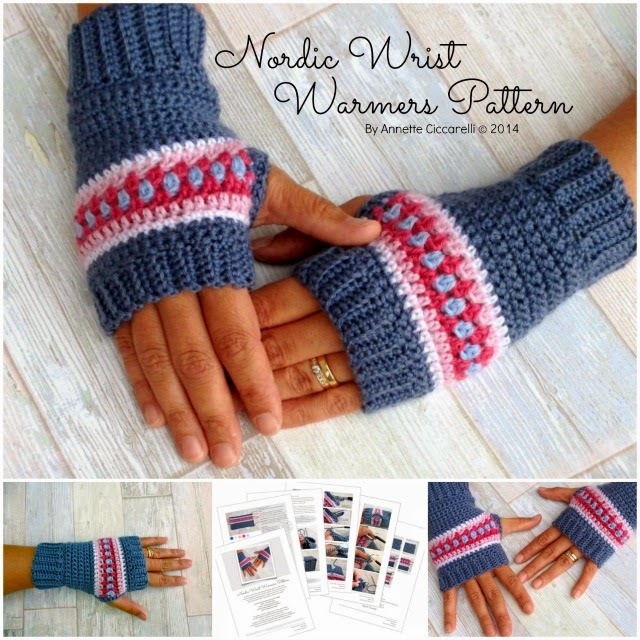 Today is the day when The Nordic Wrist Warmers Pattern is officially released. I'm thrilled to be able to offer you this fabulous pattern as it is really fun, quick and simple. And of course it matches PERFECTLY with The Nordic Shawl. I know many of you have waited for it and as usual it is loaded with Step-By-Step Picture Tutorials as well as written instructions. This is the kind of project you will make over and over again. You will equip not only your family members with these fingerless gloves, but probably also the teachers in school at the end of term, your neighbors as a "Thank-you-for-always-helping-you-out" gift, your cousins because you want them to have their own pair, your best friends because they always love everything you make... No kidding!!! The pattern can easily be whipped up for someone's birthday tomorrow and with simple steps it can be adjusted in size and be worn from age 4-5 up to a full grown big handed man. I am already on my fourth pair and I will show them all to you eventually... Just waiting for the right weather to make them justice in front of the camera lens. I highly recommend using the Ideal yarn form Bergere de France for this project, which is one of my favorite yarns to work with. It has great definition and feel to it. You can purchase Ideal yarn at LoveCrochet here. Thank you all for your support and encouragement. I hope you will enjoy. Beautiful! Best wishes with it! Looking forward to buying the pattern when my printer has been mended and I can print the pattern. These wrist warmers are lovely! I can understand the numbers better than the jumbled letters word verification!! De är sååå fina o jag ska definitivt virka ett par (minst...). Ska köpa mönster men undrar om det är någon ide att vänta på en svensk översättning ?? Tack för att du tittade in idag. Ha en toppenhelg! Åh vilka fina, köper mönstret direkt när den finns på svenska! will the pattern be available to purchase in your etsy shop again soon?? Sorry it was sold out. It is now listed in my Etsy shop again. Thanks for letting me know.